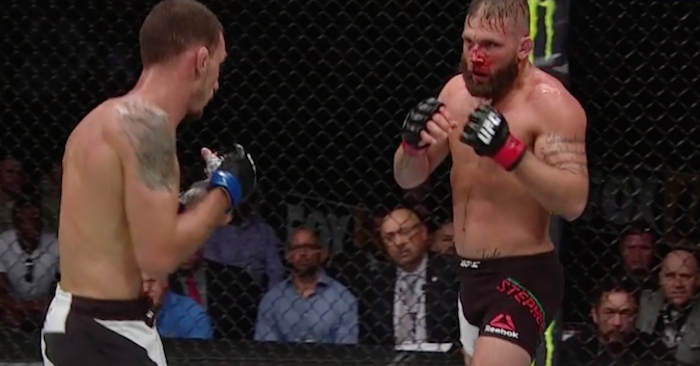 Jeremy Stephens and Renato Moicano made their way down to the octagon in the Sprint Center to kick off the main card portion of “UFC on FOX 24: Johnson vs. Reis” with their scrappy featherweight contest. Stephens hoped to get one step closer to the top of the division with a win over Moicano, while Moicano hoped to knock a top-five fighter out of his spot. Moicano opened up the fight with a series of leg kicks hoping to take the power away from Stephens. Stephens struggled to find a good angle to attack from and during a wild flurry of attacks, Moicano cut him off with a short right hook to the head. Moicano continued to chew up the inside of Stephens’ leg throughout the opening round, firing off leg kick after leg kick. Moicano circled around the octagon which allowed Stephens to try and find a good angle to attack from. He whiffed on a few wild strikes before getting taken down to the mat where the round ultimately ended. Moicano kicked off the second round with a stiff jab to the jaw of Stephens. An overhand right from Moicano was absorbed by Stephens who didn’t even seem to budge. Stephens started to find a comfortable distance to strike from in the middle of the second round, finding success with his straights and hooks. Moicano was quick to adapt, however, as he simply backed up a few steps and stayed far away from Stephens when he wasn’t prepared to engage. Stephens grew frustrated at the end of the second as his punches landed were few and far between. The two started to get aggressive at the start of the third when they both met in the octagon and started trading blows. Moicano brilliantly ducked under one of the shots and secured yet another takedown less than thirty seconds into the round. Less than forty seconds later, however, Stephens fought his way back to his feet. Once they got back to their standing, however, Moicano started his onslaught on the legs of Stephens which continued until the final minute of the fight where Stephens worked hard for a knockout blow. Moicano simply ran away from Stephens’ power shots before the final horn sounded. What do you think is next for the winner? Share your thoughts in the comment section below!